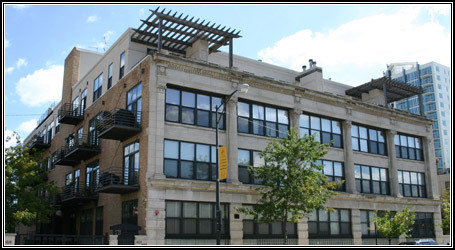 1515 Michigan Ave. was a gut rehabilitation of a historic auto showroom in the South Loop neighborhood of downtown Chicago. One floor was added to the existing building to add square footage and units. The building was converted into 52 one and two bedroom loft units with tall timber ceilings, huge windows, exposed brick walls, and hardwood floors. The project was a huge success selling out in a little over a year. In addition to the lofts the project also included eight new construction town homes that flanked the building on the north and south sides. This property was a pioneer in its area when the marketing was started, but over the past ten years other developers have added over 10,000 new units to the neighborhood making it one of Chicago’s most popular places to live.